It’s nearly Halloween, which means there’s really only one question in town. Trick? OK. Actually, we had a feeling you might do that. Here we go then. To get us in the spirit, let’s look at three frighteningly common characters from the shadowy world of the scam artist - and what you can do to hex them now - and forever. Tricks from camera clowns are flat out wicked, but sadly all too easy to fall victim to - if you’re not paying attention. They’re becoming increasingly effective too, thanks to smartphones with 40mp cameras that can find the eyes of a snoozing fly on the ceiling of the Sistine Chapel. Basically, modern fraudsters want photos of your private information - and they’re now rather good at getting at it. Their aim is to capture very detailed, very high res, very colourful photos of your shiny bank cards, credit cards, letters, statements or anything else you’ve decided to accidentally showcase to the world - even from great distances - thanks to smartphone zoom lenses. They can even blow up and enhance images after the fact, so if they didn’t quite get the shot they wanted, they get a second bite. Photos are used to clone cards, or even to aid identity theft. How to avoid them: Hurl wet paper towels at anyone you see taking photos. Failing that try to pop your card away immediately after use, preferably in a small wallet, preferably inside a pocket. Go out with a pre-paid card with maybe one or two other cards as back up - it’s safer and handy if you need to stick to a budget. Don’t take all your cards out though. And never leave a card on the table of a bar or restaurant. Don’t wave it around like a rock star. Unless you are a rock star - in which case you don’t live by the rules and probably wouldn’t take the advice anyway. Like ghosts, you never really see Mail Daemons. But they’re out there, lurking in the shadows. Regular haunts include rubbish sites, work bins, offices or outside our homes - where they get their kicks going through discarded paperwork. They’re online too. Phishing scams target victims through email links and attachments (often purporting to be from your bank, often lavishly produced, often entirely convincing). Some of the more enticing efforts include phrases like ‘security warning’, ‘payment failure’ and ‘invoice paid.’ PDF invoices have twice the appeal to the unwary - especially if you’re running a small business: “Great, am I being paid? Let’s have a butcher’s.” Or, “Hang on, I don’t remember owing money to anyone. What’s going on?” Either way, people are clicking on pdfs - and unwittingly inviting phantom viruses to run riot on their devices. How to avoid them: Invest in a cross cut or diamond cut shredder. You can pick up a decent one for about a hundred quid. Use it often, and without mercy, on anything you no longer need which shows your address and (especially) anything containing personal financial information. After that, you could consider going paperless wherever you can. Most companies welcome a switch to paperless billing as it keeps costs down. When online, don’t click on a link from anyone you don’t know (obviously), but also don’t blindly trust your bank, credit card company, accountant or a business you’re unsure of - even if it looks legitimate. They could be scammers. Banks won’t ask you to log in via a link. Instead log in via your usual means to check if your bank really does need something from you. Also make sure you have strong unique passwords, and not one for all your accounts. Check that your bank, email or any other personal account uses multi-factor authentication - and don’t be scared to switch if they don’t. How to avoid them: Researchers discovered that carrying more than one card together in a single stack (like you get with some of the neater cardholders) confuses machines used by electronic hackers. So place one or two cards in a cardholder or reasonably hulking wallet or purse (inside your front pocket) to make yourself a tougher target to hit. Ultimately, the biggest favour you can do yourself is to regularly check what’s going in and out of your bank accounts - particularly if you’re a regular tapper and swiper. You’ll get refunds on fraudulent payments relatively easily these days, but you’ll only notice fraud if you keep a close eye on your statements every other day or so. Having an all-in-one view of all your accounts in one app is a great way to be confident of your real time financial position; and switching on push notifications on apps helps you jump on any scary surprises quickly. Some apps will even help you break down your outgoings (and therefore budget better) with easy-to-read, built in ‘smart spend’ analytics. 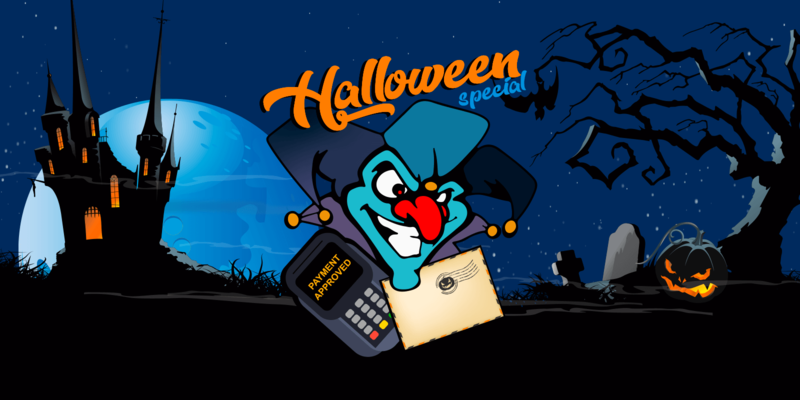 Why not tell us your Halloween financial scare stories? Share your favourites on this community post. We can’t go without mentioning the return of Halloween - the long anticipated sequel to the popular 1970s cult movie. In the U.S. the film took an eye-bulging $77.5 million at the box office in a single weekend, breaking records for a franchise. And since we know what’s successful in America tends to be eagerly hoovered up by us Brits (it seems we can’t get enough of being scared out our wits), expect excitable fans of blood and carnage to descend in mighty swarms upon cinemas everywhere in the run up to Halloween. We can’t wait!